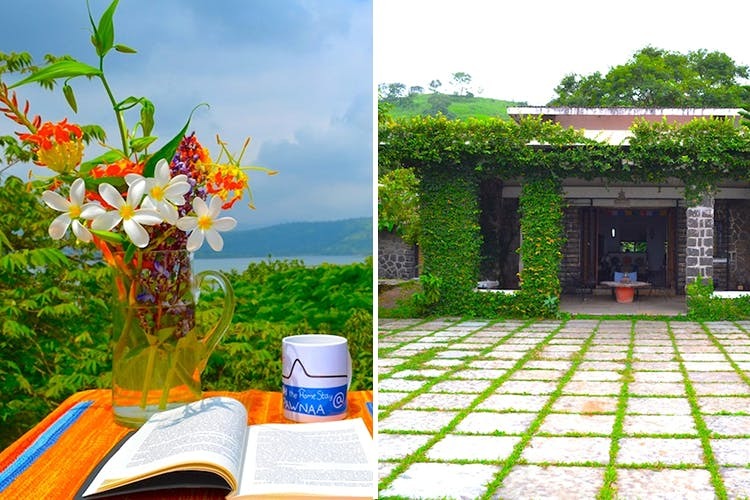 A really beautiful and thought-out homestay awaits you almost 125 km from Mumbai, right by the river Pawana. Here, in a stone-house bungalow set in a postcard background, lie beautifully done up colourful rooms, tiled bathrooms, bookshelves and cute niches in the walls. The name of this property is Deogadh The Homestay, and we first learnt about it on Wanderbug’s website here. This is located in Pawana in Maharashtra, and will take you about three hours’ time from the city by road. This place is designed for large groups, starting at 6 people. Here, there are two spacious bedrooms, a lovely sitting area outside, a hammock, a living room meant for hanging out and a fully-functional kitchen. They also have a cottage near the house called the Honeymoon Suite for couples. There are caretakers and help at the house. Also, someone who can fire up the BBQ grill for you. Also a lovely place for star-gazing, you can go on walks near the property, and go kayaking as well. Tariff starts at INR 4,000 per person, including stay, meals, the view – everything. For children, according to the age, the cost is lower. And go soon – we hear the monsoon is best enjoyed from their home, with a steaming cup of ginger tea. Book via The Wanderbug here.